I am slowly working my way towards attending Sabbath Services at the Pleasant Street Seventh-Day Adventist church. This past Saturday I finally made it down, but not for the 11:00 am Praise and Worship services. I had been invited by one of the prayer service leaders to an afternoon concert in celebration of Black History Month. It was held in coordination with two other local churches, and featured choir members from all three congregations. The event allowed me to see in action for the first time the terrific package of sound and musical instruments they have, including a full drum set, bass and guitar amplifiers, a piano and organ, plenty of vocal microphones, and a full suite of video and audio recording equipment. The concert was both a history lesson and musical performance. A narrator told stories about the different hymns and spirituals that were then sung or performed by various combinations of musicians and singers. A definite highlight was a young girl who played a trio of tunes on the violin, including a lively fiddle tune, accompanied by a terrific piano player. I was excited to see “Amazing Grace” on the program list, since I have always counted this as one of my favorite spiritual songs. A group of women came up on stage and I settled back to enjoy the singing. To my surprise and disappointment, recorded music began coming from the sound system. A voice began to sing on the recording, and the eight or so women up on stage—dressed in matching robes and sashes—began translating the song into sign language. They signed in perfect unison, as the song swelled and subsided, smiling and proud of the work they were doing. Although “Amazing Grace” sounds like a cry of hope from the depths of black slavery, the song actually was composed by a white man—even more astonishingly, by a white British man who spent much of his life working in the slave trade. The narrator reminded us of the song's history; I had actually just read it about in a textbook I am using in class which covers the history of the slave trade in England. John Newton (pictured above) was a sailor in the British Navy in the late 18th-century, and then took a place aboard a slave-trading ship. For several years he sailed up small African rivers, procuring slaves and taking them into larger cities where they would be sold and bound for America. 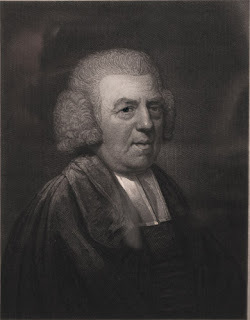 Eventually he had a conversion experience, and wrote “Amazing Grace” as a spiritual autobiography in 1772. The song was immediately popular, and eventually found a place in the canon of African-American spirituals. One author of a critical work on gospel music labeled the song as reflecting the “universal testimony” of the African-American experience of delivery from slavery and oppression. So here in the Seventh-Day Adventist church, on a Sabbath afternoon, I find again the incredible potential that spirituality has to build bridges and foster community among disparate peoples and communities. A white man from the American Midwest, I sit in a church of black New Englanders transplanted from the Caribbean, listening to a song composed by a white British sailor and beloved by African Americans, and watching a group of women signing its lyrics to a church full of people who have ears to hear.